The Bonham Centre for Sexual Diversity Studies invites you to join us for the third annual Queer Directions Symposium! 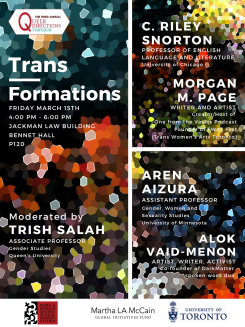 This year’s event is entitled Trans/Formations, with guest speakers C. Riley Snorton, Aren Aizura, Morgan M. Page, Alok Vaid-Menon, and respondent Trish Salah. It will be held in the Jackman Law Building, Bennett Hall P120. This event is free and open to the public. Riley Snorton is a Professor of English Language and Literature at the University of Chicago. He specializes in queer and transgender theory and history, critical race studies, performance studies, and popular culture studies. He is the author of Nobody Is Supposed to Know: Black Sexuality on the Down Lowand Black on Both Sides: A Racial History of Trans Identity, winner of the Lambda Literary Award for Transgender Nonfiction, the American Library Association Stonewall Honor Book in Nonfiction, the American History Association John Boswell Prize and the Modern Language Association William Sanders Scarborough Prize. The book draws together an archive ranging from early sexological studies to fugitive slave narratives and twentieth-century journalist accounts of Black trans people to make a compelling case for the ways that blackness and transness co-constituted one another in their historical construction. Snorton has been a recipient of a National Endowment for the Humanities fellowship at the New York Public Library’s Schomburg Center for Research in Black Culture, an Andrew W. Mellon postdoctoral fellowship at Pomona College, and two fellowships at Harvard’s W.E.B. Du Bois Institute for African and African American Research. Aren Aizura is Assistant Professor in Gender, Women and Sexuality Studies at the University of Minnesota, where he specializes in queer theory, transgender studies, transnationality and immigration, political economy and labour. Aizura’s research looks at how queer and transgender bodies shape and are shaped by technologies of race, gender, transnationality, medicalization, and political economy. His book, Mobile Subjects: Travel, Transnationality, and Transgender Lives (Duke University Press 2018) examines how understandings of race, gender, and aesthetics shape global cosmetic surgery cultures and how economic and racially stratified marketing and care work create the ideal transgender subject as an implicitly white, global citizen. In so doing, he shows how understandings of travel and mobility depend on the historical architectures of colonialism and contemporary patterns of global consumption and labour. Alok Vaid-Menon is a gender non-conforming performance artist, writer, educator, activist, and style icon. They use their poetry, performance, and eclectic fashion to challenge the gender binary and celebrate gender non-conformity. In 2015, with Janani Balasubramanian, they created DarkMatter, a spoken word performance duo. They have performed and been invited to speak around the world. In their 2017 poetry chapbook, Femme in Public, on social media, and in numerous online articles and interviews they embrace radical vulnerability and celebrate a complex vision of transfemininity that disobeys conventional notions of gender performance and embodiment. Trish Salah is Associate Professor in Gender Studies at Queen’s University. Her work focuses on transnational studies in gender, sexuality, race, and minority cultural production. Her current SSHRC funded research project, Towards a Trans Minor Literature, examines the aesthetic and political projects of trans, transsexual, genderqueer, and two-spirit writers. She was co-organizer of the Writing Trans Genres: Emergent Literatures and Criticism and Decolonizing and Decriminalizing Trans Genres conferences, and is the author of two books of poetry, Lyric Sexology, Vol. 1. and Wanting in Arabic, for which she won a Lambda Literary Award. She was a finalist for the 2018 Ogilvie Prize for LGBTQ Emerging Writers nd recently co-edited a special issue of TSQ: Transgender Studies Quarterly on Trans Cultural Production.